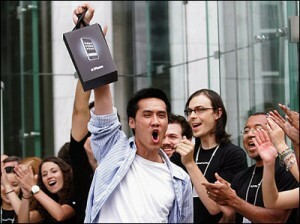 The Secret Diary of Steve Jobs : iPhone users suffering from Stockholm Syndrome? iPhone users suffering from Stockholm Syndrome? “Stockholm Syndrome” was named after a hostage drama in Sweden. Hostages were held for six days but dealt with the psychological stress by defending the very people who were holding them. Got that? OK. This piece says that Apple fans defend the iPhone despite shortcomings the unit has. In other words, it may catch on fire, blow up, or make your life miserable sometimes, but since it’s from Cupertino, you’ll love it ’til you die. Sounds about right…what’s the problem?